(CTV) Vandals spray painted anti-Semitic messages throughout a pair of southwest Calgary neighbourhoods overnight and residents are outraged. 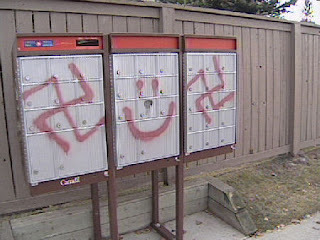 On Sunday morning swastikas and several hateful messages were discovered in the communities of Pump Hill and Woodbine. Police say the vandals went on the spree some time between 11:00 p.m. Saturday night and 8:00 a.m. Sunday. Investigators are talking to residents and are reviewing some surveillance tape. Police say that if they catch the vandals, they will be looking at hate crime charges.